You can still travel and get good bargains in this tight economy by using the latest technology. Jaunted.com editor at large Shira Lazar, you can use the newest technology to improve your vacation. Jaunted is a travel and pop culture site. Best of all, everything she discussed on The Early Show on Monday, from hotels to airlines and even restaurants, was completely free. Lazar said using Twitter, the Internet hot spot known for updates in 140 characters or less, can be a great place to find inexpensive travel options. She said one of the site's advantages is the updates are made in real time. Users can use their computer or text from cell phones to make instant responses to bargain-hunting travelers. Lazar said you can also search for exactly what you want, and find people to chat with about the same interests. "It's local, it's real and it's now," Lazar told The Early Show co-anchor Harry Smith. Lazar said some travelers find hidden gems by getting advice from locals at their destinations. She said Twitter travelers who ask for restaurant or hotel recommendations are often greeted with dozens of responses -- or better yet -- an offer to sleep on someone's couch. Lazar said one such user, "Twitchhiker", a British adventurer Paul Smith, actually traveled to New Zealand, the U.S., Germany, France, and other countries, using only offers of lodging and tips on where to go from Twitter users. He has more than 12,000 followers on Twitter. Lazar added discounts can even come your way from hotels and airlines getting on the Twitter bandwagon. Lazar said one of her colleagues recently posted about her upcoming trip to Portland, Ore., and several hotels, including the Hotel Lucia and the Hotel deLuxe responded with a 25 percent discount if she followed them on Twitter. Lazar also shared the Web site Tripit.com that she said makes travel planning easier by organizing your itinerary. You e-mail in all the details of your itinerary from hotel to plane reservations, Lazar explained, and it creates a master itinerary you can send to friends, and traveling companions. The site automatically syncs with your handheld device and there is a free application, she said, that allows you to sync to your iPhone, so you can also upload photos of your trip. Lazar also recommended Dopplr.com. The site is open to only people you want to see it. You make an account profile, she said, and put in your previous and future travel so your friends and family can track where you've been and where you are going. Lazar said by using this site you can learn about places from friends and family and get their recommendations for inexpensive travel. "Use your friends and your community as the experts," she said. Another site Lazar called "fun" is Couchsurfing.org. Couchsurfing is for the more adventurous traveler, she said. The site connects users with willing hosts in other cities or countries that will let you stay on their couch, or in an extra bedroom for free, or in exchange for dinner, Lazar said. People use the site often for big events, she said, such as the Super Bowl or the Olympics. Lazar recommended would-be couch surfers do their research, and meet with the hosts first, if possible. She said couch surfers post their reviews, so you should try to reach out to these people to check out your hosts before your stay. Over a million people have used Couchsurfing.org to find a free place to stay on their travels, she said. 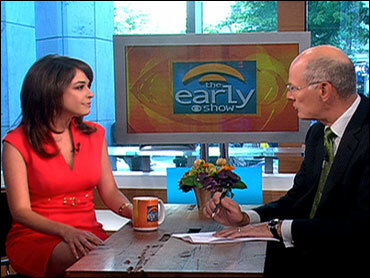 The iPhone and iPod Touch applications, Lazar told CBS News are also handy for the traveler. Lazar said some free travel applications can help you translate a foreign language, while others can help with other common traveler needs. AirportStatus helps you get the latest delays and airport closings; ACTCurrency translates currencies from one country to another instantly. The Taxi! application also helps when you find yourself needing a car in unfamiliar cities.